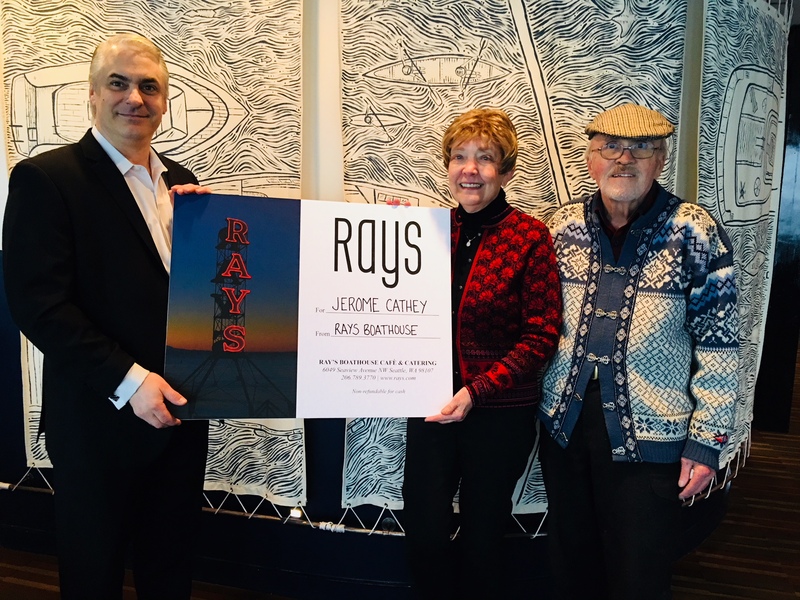 Announcing the Winner of ‘Dinner for a Year’ at Ray’s! 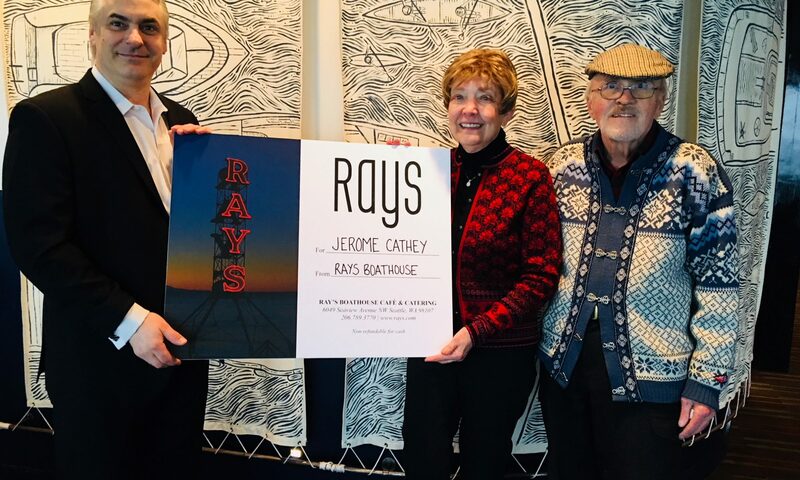 Congratulations to longtime Ray’s guests Jerome Cathey and his wife Janice! Pictured above with our GM and Co-owner Douglas Zellers. Thank you to everyone who participated in our Win Dinner for a Year at Ray’s contest. Stay tuned for more exciting events in 2018 as we celebrate our 45th year! Drumroll please! After sorting through your emails, tweets, comments and survey answers, we are pleased to present our Guest Favorite Menu! This 3-course menu showcases your all-time favorite Ray’s appetizer, entrees and dessert from our 44-year history. This limited-time menu will be offered a la carte in the Boathouse and Cafe from Wednesday, November 15 until Tuesday, November 21, as part of our “Win Dinner for a Year at Ray’s” contest. Use your Loyalty Card each time you dine until November 21 at 9 pm to be entered to win “Dinner for a Year at Ray’s.” Don’t have a Loyalty Card? Sign up for free today! 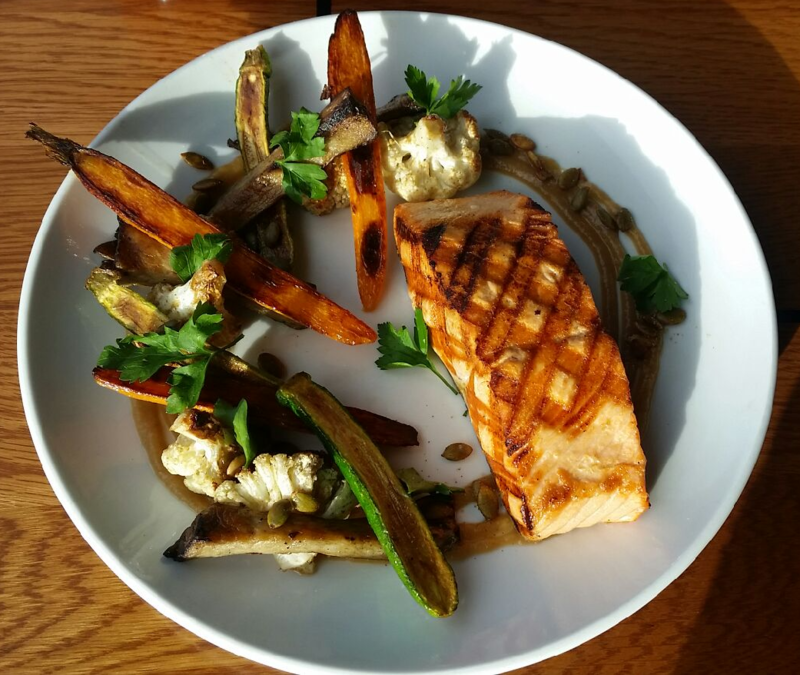 To make a reservation for the Cafe call 206.782.0094 or visit online, or the Boathouse at 206.789.3770 or visit online. Win Dinner for a Year at Ray’s Nov. 1-21! This November, as we look forward to 2018 and turning 45, we want to pause for a moment to celebrate the past, present and future of Ray’s, with you our beloved guests. From November 1-21 enjoy three weeks of special menus that throwback to memorable moments and eras in our history. 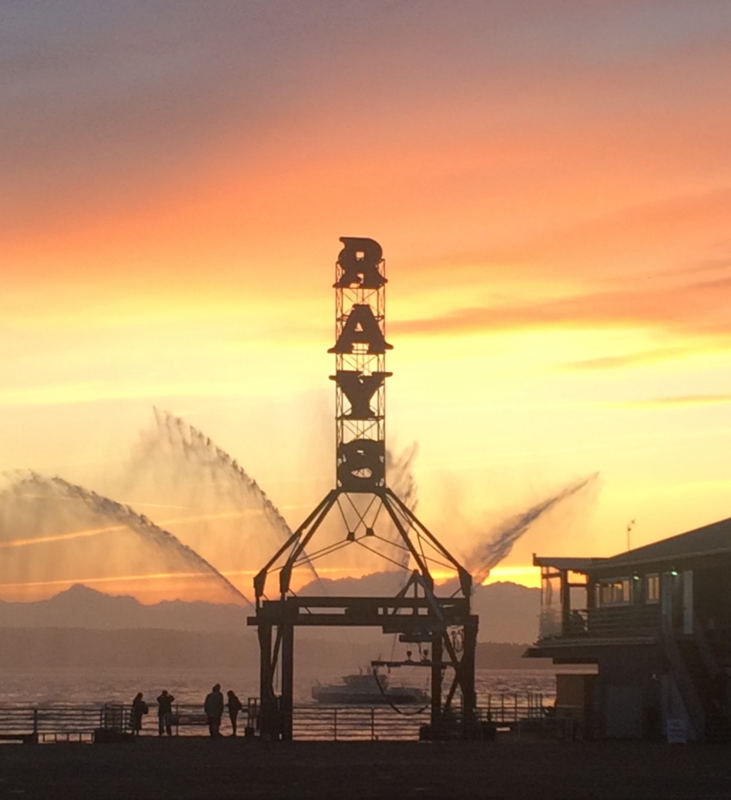 It will conclude with the drawing of a very special prize… Dinner for a Year at Ray’s for one lucky guest! But first we want to hear from you! Help us create a special 3-course menu of your favorite Ray’s dishes during the final week. Describe for us your most memorable Ray’s appetizer, entrée and dessert dishes from a recent experience (one in each category) or get out your copy of Ray’s cookbook, “Seafood Secrets of the Pacific Northwest” and tell us which appetizer, entrée and dessert is your favorite by Friday, November 3 at 11:59pm. Then our Executive Chef Paul Duncan will recreate a 3-course menu made up of the top item in each category, available in the Café and Boathouse Wednesday, November 15-Tuesday, November 21. Tell us your top choices on Facebook, Instagram or Twitter, email us at rays@rays.com, or fill out a quick online poll. Don’t have a cookbook? Don’t worry we have some gently used copies available for purchase at the Café. Starting Wednesday, November 1, 2017 and ending at dinner service on Tuesday, November 21, 2017 each time you dine at the Café or our first floor Boathouse and use your Loyalty Card you will be automatically entered to win dinner for a year at Ray’s Café and Boathouse. The more times you dine the more chances you have to win. On Wednesday, November 22 we will put all of the entries into a drawing and choose a winner at random. Don’t have a Loyalty Card sign up here and start entering to win today! Each week we will feature a different multi-course menu with nods to our past, try all of them and get entered to win each time! November 15-21: You Choose the Menu! Experience your favorite Ray’s recipes in a 3-course menu that you, our guests created! We will be tallying up votes from your emails, social media comments and our online poll, to determine which appetizers, entrées and dessert to serve. The top item with the most votes for appetizer, entrée, and dessert will make up the menu. We will announce this guest favorite menu via social media before it begins. Good luck to all, and we look forward to seeing you soon! Use your Ray’s Loyalty Card each time you dine from November 1- 21, 2017 and be entered to win dinner for a year at Ray’s. Each time you use your Loyalty Card your name will be entered in to the drawing to win dinner for a year at Ray’s, good in the Café and Boathouse. Must have a Loyalty Card with a valid phone number to enter. Sign up here or at Ray’s Café or Boathouse. One entry per day per venue (Café and Boathouse) will be counted towards the contest. No minimum purchase amount is necessary to participate. One winner will be drawn at random on Wednesday, November 22 to win Dinner for a Year at Ray’s, valid through November 30, 2018. We will announce the winner via Facebook, Twitter and Instagram and contact them via phone. Entries are limited to one per day per venue (Café and Boathouse). You will be entered each time you dine during this period and use your Ray’s Loyalty Card. Start date: Wednesday, November 1, 2017 at 11:30 a.m. P.S.T. ; entries made prior to this will not be valid. End date: Tuesday, November 21, 2017 at 11:59 p.m. P.S.T. ; entries made after this date will not be valid. Winner must claim prize within 48 hours of being contacted by Ray’s via social media, email and/or phone. Or we will draw again. Employees of Ray Boathouse, Inc. and their immediate families are not eligible to participate. By claiming a prize, the winners consent to Ray’s use of their names and image/likeness including photography and video in future Ray’s marketing and advertising without compensation or further approval. Further, by accepting a prize, the winner agrees not to assert any claims and to release Ray’s, from any and all liabilities, injuries or damages sustained in connection with the award or use of the prize. Winners are solely responsible for reporting winnings and paying all applicable taxes. The odds of winning will be one out of the total number of eligible responses submitted. $2,600 gift card to use toward “Dinner for a Year at Ray’s.” Valid in the Café and Boathouse through November 30, 2018. Equates to $50 per week for 52 weeks. Cannot be used on Ray’s merchandise or in combination with any other offer. Void where prohibited / restricted by law. Paying and reporting taxes (if any) are the winner’s sole responsibility. Prizes may not be substituted, transferred, redeemed or exchanged for cash, except at the sole discretion of Ray’s. Ray’s is not responsible for illegible, damaged, lost, late or misdirected entries. All submissions become property of Ray’s. Ray’s reserves the right to refuse all prizes to any client who in their sole determination abuses their right to participate or violates the rules. Should the winning submission be determined to be untrue or false in any way, the winner must be responsible for any and all real costs associated with grand prize or another winner may be picked at the discretion of Ray’s management. All conditions, rules, and regulations of Ray’s Loyalty Card program apply. These are the official contest rules of the “Dinner for a Year at Ray’s” contest. These rules may be subject to change without notice.